you can hear him at 12:51 saying that they couldn't do a 0-100 run because they couldn't find an open stretch. While GTO is GTO and Teambhp is Teambhp with highest levels of integrity, there are a few (only a few) YouTube reviewers that have delivered unbiased content years after years. I disagree. I think the XUV does match the S-Cross. By performance, are you referring to the 1.6L turbo Rocket? If yes, then no doubt. Yes, of course I am referring to the S Cross 1.6, and not the 1.3 engine. I have never been enamoured in any way by the 1.3 DDIS. Given the 115 BHP and 300 NM torque specifications of the XUV300, the specs of the S Cross 1.6 were in the same vicinity. However, the driving characteristics of both these engines are pretty different. The S Cross 1.6 was an absolute stonker, and I regret not being able to purchase one when the car was available in the market. 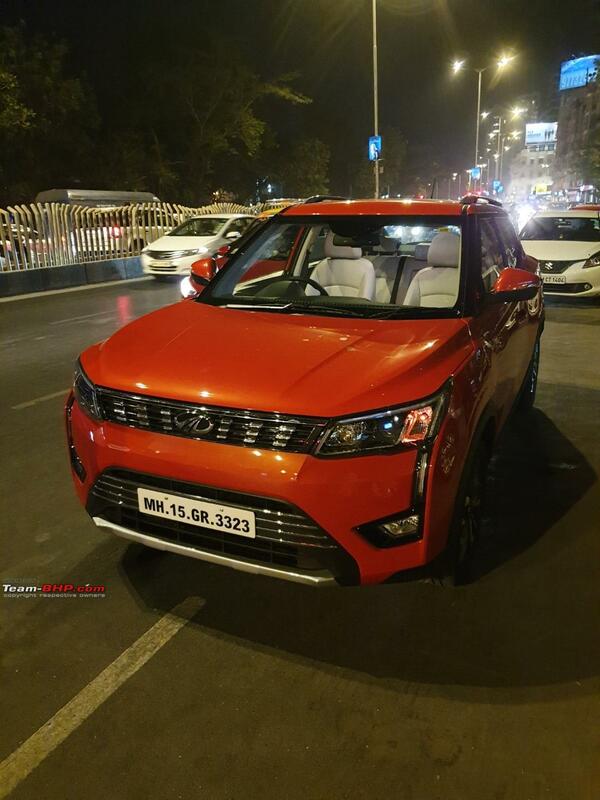 I was quite disappointed at the lack of any evident torque below 2000RPM in the XUV300, and my driving being mostly in the city, that kind of powerband is more or less useless for me. Especially given the fact that Mahindra advertises the peak torque kicking in at 1500 RPM, which is definitely not accurate. That is why I mentioned in my earlier post that the XUV300 would be a very capable highway cruiser since, 2000RPMs and above are frequently seen on a highway drive. Of course, now I find from GTO's post that the suspension at high speeds is unsorted. There is no way in hell that a normal city test drive would tell me this, and hence, I am happy that I refrained from following through with my initial booking. This was one of the most useless reviews that I have seen recently. It concluded absolutely nothing other than that the XUV is superior to all the other competitors. Funny thing is, there was nothing of substance that the reviewer analysed about each of the cars. It was all very generalized and not much of detailed comparison. Given that NDTV has been doing paid promotions on multiple occasions for the XUV 300, it is easy to see that the conclusion was a foregone one. Very disappointing. Last edited by arindambasu13 : 4th March 2019 at 09:19. Wow the poor rear suspension is a shocker and high speed stability can be a major problem. On highways people are seen doing 120+ even in Altos and Kwids. It is shocking that Mahindra would make such a blunder. It seems to a combination of an overly sensitive steering and also a skittish rear suspension which has too little loading and hence loses traction at the rear. It seems Mahindra has taken the same springs and shockers as the Tivoli and not compensated for the reduced weight or length of the car. This car would definitely need ESP too if it is so imbalanced. Mahindra would need to probably make the rear springs softer and retune the shocker setup to fix it, but that is something which needs a lot of fine tuning and should have been done before launch. Last edited by Behemoth : 4th March 2019 at 09:18. I can't believe Mahindra can make such a blunder about dynamics of the car. 1. Any visible oil leak from rear shocks ? 2. How's the action of rear shocks ? You can check by bounce test. Now a fellow BHPian has confirmed about a circular from Mahindra too. I hope this would be corrected soon. New Owners should be careful and make sure they are not running with defective shocks. Mahindra might not recall and silently change the shocks in affected cars. Last edited by Dr.Naren : 4th March 2019 at 09:40. I am pretty sure that it is a defective car else you can't have this level of incompetence in the suspension even if tried to. But it also makes me wonder to what level is the suspension shot to cause such behaviour. Mahindra read my posts and reached out last night. They think it might be a defect with this test car and are going to send us the diesel today, along with another petrol later. to Mahindra. A company that holds it ears so close to the ground (read TeamBHP) could not have made such a blunder. What, it's just a few hours and about 15 replies since your post, and they are already at your door!! I would still hold my judgement on this part. Clearly they seem to have goofed up on the boot space. But otherwise, they've been testing this car for ages now (just see when this thread started), and employed a top racer for publicity, let's hope this was a defective one of some sort (questions on their QC though). Waiting for the full review, fingers crossed. Shock-absorbers are, as the name goes, are meant for only absorbing the shock to create a damping action. A defective shock absorber can affect only one point of GTO's observations, which he felt 1-2 feet bump in the air. Tail swing & vehicle unstability depends completely upon suspension & center of cravity. If C.G. is good, front engine & front wheel drive vehicles are tend to slightly understeer, which is intended. But if C.G. is messed up, then vehicle can fish tail badly. What I felt (after watching the pic for the first time), this is way disproportionate vehicle. May be a drive with Diesel variant will throw some more light on it. Well there was an Autocar video in which the driver even clocked some 160 kmph on salt-pans in GJ. After reading through your feedback on highway and high speed manners, I guess the Autocar driver is blessed with a pair of titanium. Thanks for the review GTO! I was one of the person who was sort of hurrying into buying the car and thank god haven't booked one yet. Although I hope it's a defective unit, I will always have second doubts over the car going on a highway. Do you all think the Creta 1.6 petrol e+ variant would be a better but then the XUV? I was planning to book the w8 version but after reading the review, I believe Creta will be the safer choice. Price is almost similar with the Creta being 20-30 thousand cheaper. Any visible oil leak from rear shocks ? I told Mahindra that I appreciate their quick action (a lot has happened in 24 hours - credit where its due). Equally, I'm glad nothing untoward happened while I was driving the car on the expressway!!! This is the first time in my reviewing experience that I've ended up with a defective suspension on the highway. Stuff happens & I understand, but the thought is still unnerving. If you've bought an XUV300, I would strongly recommend that you call your dealer & check if your car is affected. If the dealer can miss checking out a brand new media car, I wouldn't rule out their missing a customer car either. So, how does a regular XUV300 drive? I frankly don't know. Will be taking another petrol for a spin this weekend. I have asked them to give me the same car with updated shocks. I will share my driving opinion post. Last edited by GTO : 4th March 2019 at 14:07. Thanks GTO for the update. I think it's great that you asked for the same car with updated shocks. Yesterday, i was thinking of suggesting the same to you. It is good to hear that a defective suspension was behind it. In my test drive i am confident i did cross 100 kmph. I wasn't particularly paying attention to the speed, but it is very likely i should have touched 120 kmph at least for a few seconds during the 40 km test drive. I came back with the impression that the car felt very planted and stable, and that is where it scored over the EcoSport tdci. Its steering was not as communicative as that of the EcoSport. And the handling was not as sporty either. There was slightly more turbo lag than EcoSport too in the low end. But where it really scored over the EcoSport was in how planted it felt, and the impressive ride quality. I think that but for the defective suspension, the car is just fine. Hopefully we will come to that conclusion once they send you back the car with the defects fixed. Last edited by PYSO : 4th March 2019 at 14:13. That's great. Good to hear about the defect and also for the Company Mahindra, for taking pro-active action, and that too in a very short time. High speed testing is part of pre launch test mules. Regarding the tyre pressure, I guess the tires will be over inflated by 10-15 psi, while transporting. Kudos to Mahindra for diagnosing the issue quickly. Any bump can throw the car off balance, sending it out of control. Going over railroad trails, potholes or even speed bumps can easily cause a car accident. If a shock absorber is leaking, it is faulty and should be replaced immediately. Glad that there was no untoward incident when the car was on the expressway. That's very quick response from Mahindra! Credit where it's due, Mahindra responded swiftly and positively. Also, more importantly they have been transparent about the issue.This definitely instils confidence in the brand. The car was picked up by Mahindra this morning. 2 engineers from Mahindra Research Valley had been flown in to inspect the car. Good to hear that! Compared to our other home grown manufacturer who can't even get 1 test drive car in time, Mahindra seems to be working with lightening speed in not only getting the test car out but repairing it as well!